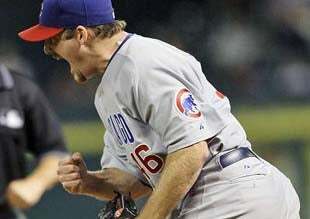 Lee to Theriot to Dempster is the new Tinkers to Evers to Chance? With a runner on third and nursing a one-run lead, reliever Ryan Dempster induced a bad-hop grounder to first baseman Derek Lee, who converted it into a game-ending double play. Cubs 3, Astros 2, and coupled with Milwaukee's 7-4 loss to the Pirates, Chicago is back in a first-place tie with the Brewers in the Whack-A-Mole game that is the NL Central. But in a stunning and unprecedented move, I'm going to go ahead and call this one for Chicago, mostly because of manager Lou Piniella's new, Zen-like approach to it all. "We are who we are" is the baseball quote for the new millennium, and coaches everywhere would do well to repeat it. Fans as well should learn it; especially the ones frustrated over the Brewers and Cubs bobbing up and down into and out of first place in the Central. On Wednesday it was starter Rich Hill and the venerable Cliff Floyd (home run, triple) who led the way for the Cubs. Now, to the schedule. Of their 17 remaining games, the Cubs have only six at home, and four of the road games at St. Louis beginning on Friday. For the Brewers, 10 of their remaining 17 are at home, but the last four are against San Diego, which most likely will still be fighting to get into the playoffs. • All Right, Thats It For Me Everyone, Goodnight. So who is your choice for AL and NL Manager of the Year? Diamondhacks humbly submits Bob Melvin for the NL award, reasoning, I think, that he wins by attrition. Since this is the most random of all the post-season awards and my pick is as good as anyone's, I'll go with the Mets' Willie Randolph. And in the AL, because he adhered to the George Costanza method of "getting out on a high note," I choose the Mariners' Mike Hargrove. • The Book Of David. It seems like we haven't heard from out friend David Ortiz in ages, so let's check in on his two-run homer in the ninth that won it for the Red Sox, 5-4 over the Devil Ray Fish. Ortiz had two homers and five RBI in all as Boston stayed five up on New York in the East. • Yankee Onslaught Continues. Hey kids, Mike Mussina is back! Only two weeks after being dropped from the rotation for sucking, Mikey pitched six shutout innings as the Yankees beat the Blue Jays 4-1, their seventh straight win. • ... And You Don't Mess Around With Jim. Let us pause to honor Jim Thome, who got his 499th homer and drove in three runs to lead the White Sox over the Indians 7-4. Soon he will become the 23rd player to reach 500.